Before The Slow Poisoner (aka Andrew Goldfarb) played at the Lovecraft Bar last Friday, Goldfarb, Kirsten Alene, and I went out in search of craft-brewed herbal cola, Victorian lemonade, and pork rinds. On our little excursion, we discovered several pages nearly destroyed by the weather, just sitting on the sidewalk. What follows is those pages, transcribed to the best of my ability. What’s your interpretation of The Gospel of Dorian Ambrose Cannon? What does it mean for the rest of humankind? Perhaps most importantly, who was Dorian Ambrose Cannon? Unravel these mysteries in the comments section. If your answer is chosen as the best, you’ll go down in history as a scholar of Dorian Ambrose Cannon and win yourself another gospel to decipher, the incredible Amazing Stories of the Flying Spaghetti Monster. In 2005 a young man sent a message to the state school board in Kansas, and inadvertently created a cult icon. Bobby Henderson’s letter to the Kansas Board of Education was in response to the board’s plan to teach the scientifically unfounded theory of “Intelligent Design” alongside the more scientific Evolution theory brought to us by Charles Darwin. Henderson’s logic is that if these intelligent design folks say an unknown being created the universe, why can’t this being be a floating mass of pasta. Thus, The Flying Spaghetti Monster was born, and a cult of followers who called themselves “Pastafarians” began spreading his tasty word around the internet and anywhere intelligent design was being debated. While I am not a devout Pastafarian (I am happy being a Methodist, do it please ya) I like the idea of FSM and what he stands for which is basically pointing out right wing loons and their falsehoods. That is something I get a kick out of quite intensely, and being someone who has at least a few books on the religious right on his shelf, right next to F.A Hayek’s The Road to Serfdom and Hunter S. Thompson’s Generation of Swine, I find that this kind of humor is also well founded. The only problem was is that we had no works of fiction that could capture FSM’s giddy mixture of religion and Monty Python silliness without being contrived(look at the star ratings for the book God Speaks and the reviews inside to see what I mean.) until now. 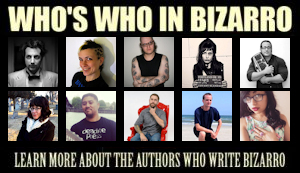 Cameron Pierce, whom I consider the Bizarro offspring of Tim Burton and Lloyd Kaufman, has created, alongside 23 of his equally loony contemporaries, what amounts to the mother of all FSM books. That book is Amazing Stories of the Flying Spaghetti Monster. Creating a collection is not easy, some stories are juicier and more tender cuts and some stories are gristly, tough, and dry. 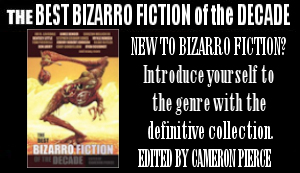 Like a master chef crafting the ultimate pasta dish Pierce has blended perfectly savory bits of humor with spicy and flavorful darkness in every story he has included in this collection. Among the highlights are Steve Lowe’s take on a young man’s encounter with god and one Olive Garden employee that just doesn’t believe, S.G Browne’s take on James Lipton’s interview of his “Noodly Goodness” on a spin-off of “Inside the Actor’s Studio” And Adam Bolivar’s take on FSM’s attempt to become a god that features the odd pairing of Charlie Sheen and Cthulhu in one story. I loved this book, it’s not only a good read it is also a good showcase for the talent of the writers included. Right away I began seeking out some of the author’s stuff more recently completing Spore which was written by two authors in this book, John Skipp and Cody Goodfellow. 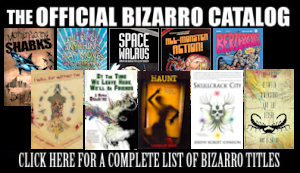 This book is a perfect gateway to the Bizarro genre for those who can’t see themselves reading the genre’s more offbeat titles. So what are you waiting for? Get this book and be touched by his Noodly Appendage! 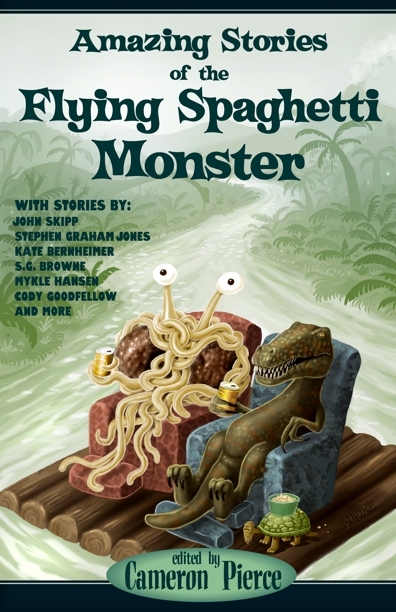 Amazing Stories of the Flying Spaghetti Monster featuring stories by John Skipp, Stephen Graham Jones, Kate Bernheimer, S.G. Browne, Cody Goodfellow, Mykle Hansen, Kevin L. Donihe, Bradley Sands, Jeffrey Thomas, Kelli Owen, and many more, is available now on Amazon! Amazing Stories of the Flying Spaghetti Monster edited by Cameron Pierce and featuring stories by John Skipp, Mykle Hansen, Cody Goodfellow, J. David Osborne, Kevin L. Donihe, Bradley Sands, David W. Barbee, Kirsten Alene and more, is available now!